I continue to experiment with digital “painting” on my photographic images. As I mentioned last week, I have been using Corel’s Painter Essentials 5. The full Painter program looks pretty awesome, but a bit rich for my blood. But I have been impressed with the estimable “light” version in Painter Essentials. I made the barn image a few years ago, driving around my home county in Saginaw, Michigan. While it caught enough of my attention to stop and photograph it, I never really thought much of the resulting photographic image. As I began working with the paining programs, however, it seemed like maybe this was an image that had some possibilities. I used the “impressionist” paint filter in Painter Essentials, and then brought the image back into Photoshop to do some final editing. I like the final result. The Clearwater image was made with my cell phone, while meeting some friends from home who were visiting Clearwater Beach a couple years ago. This was the view from an outdoor bar at their hotel, overlooking Clearwater Harbor. I played with several different modes in Painter Essentials, eventually landing on this “watercolor” rendering. Painter Essentials has a mode called “illustration.” It rendered this image with an impressionist look. This is an image that has, off and on, been featured on my website, Facebook Page and this blog. I have always liked the photographic rendition. But this is pretty cool. too. Here we go again. It’s fall foliage photography season. Are you ready? Over the nearly 10 years since I started blogging here, I must have blogged about fall color and foliage a dozen times. Maybe More. Not surprisingly, it remains a favorite subject for me. For some who are fortunate enough to have great foliage photo-ops in their backyard, what I will say here may not apply. But for perhaps the vast majority of us, these opportunities often come only after travel to a more aesthetically accommodating venue. I have traveled to New England (prominently: Vermont), the Upper Peninsula of Michigan, Maine, Minnesota, West Virginia, Virginia and New Mexico, in various years, to photograph fall color. Vermont has long been a love of mine, and I have made numerous trips there; enough to prompt me to take my first foray into “publishing” with the first edition of “Photographing Vermont’s Fall Foliage” in 2012. As the previous blog notes, I am very happy to announce the 2nd Edition of this book, with updates and substantial additional locations (the first edition is no longer available, as the sellers required that it be removed from circulation in order to sell subsequent editions). The New Edition is currently available on Amazon, Apple, in the iBookstore, and Kobo. Many of the persons I communicate with at this time of the year are primarily leaf peepers with cameras. For those folks, go and enjoy! For serious photographers, I want to make a few observations, based on my own travel experience. Mental preparation is the most important piece of this. 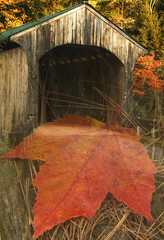 Just because it is fall foliage season, doesn’t mean the rules for good photography change :-). It is important to be thoroughly familiar with the gear you will be using, as the “window” for a great image is often very short, and you may only have one chance to visit the location. In 2010, prior to my planned week-long trip to Vermont, I hit a milestone of sorts, in my own photography. I had always planned my locations and tried to find as much “intel” about a location as I could. But this time, I focused less on those details, and instead gave some contemplative thought to what I wanted to present visually, emotionally, and artistically. I think this contributed to one of my most successful trips. What you can take on a trip is also always a consideration. When I shoot near home, or somewhere I can drive to, the photographic gear I will take is generally only limited by what I own (and can afford). When flying, you really have to consider weight, and bulk. Most of us do not feel comfortable checking a bag with photo gear in it for a number of reasons. So what can you carry on, along with your other needs? One of the miracles of modern technology is the ability to make great images with a lighter, simpler gearset. For “casual” travel (I define that as any travel I do that is not specifically and solely dedicated to photography), I now carry a very small, packable carbon fiber tripod and the RXSony 100 iv (a point & shoot sized camera, with some professional credentials). Even when I go on a dedicated photo shoot, the camera, lenses and tripod are much small and lighter than in the past. However, that there are other considerations that will have a more direct bearing on the successful image. Understanding light, and composition will have much more effect on imagery, in my view, than any other factor. This assumes, of course, that you already have a solid grounding on exposure principles, how to focus the camera, and considerations of aperture and depth of field. This relates directly back to the first point: preparation. If you do not come to your subject in the best light, it will be difficult to make a really great image. More often than not, this means early and late (or–think: during breakfast and supper :-)). Much of my more recent travel has centered around other activities, such as family time, tours, etc. While I do make images, it is often apparent that they were not take in the “best” light, and I frequently lament that it would be nice to be at a location either very early or in the late afternoon/early evening. If your trip is photography-focused, you will need to be mentally prepared to be on site at times that may be inconvenient to others you travel with. When I have made my fall foliage trips, the majority of them have either been alone, or with other, equally serious, photographers. Don’t forget the “other” gear you may need. Most fall foliage locations have the potential for very warm weather, rain, and even freezing temperatures (especially at sunrise). Hat, gloves, sunscreen, and adaptable clothing is important. Most important of all, though is to have fun and enjoy the process as much as the result! Best to all of out out there and good shooting! So, this morning, I spent some time with my friend, “GOOGLE,” and found this article, “ Why Facts Aren’t Always Truth In Photography“. Many will remember the Afgan Girl magazine cover that (perhaps) launched photographer Steve McCurry into international recognition. He has recently made news (at least in the photographic world) again. Without getting into the specific circumstances of the article (written by a colleague and fellow professional photographer, Peter van Agtmael) it’s “10,000 foot view” is, in my view, focused more on some principles of “truth” in photography that can be generalized. And boy, did it resonate with me. In fact, it can — I believe — be applied to much of what has gone on in the past several months over media, social media and even the coffee table. Starting with one of my earliest posts, “Get Real,” and for example, “Has The Digital Medium Changed Everything?,” and “Photoshop Is Not Evil,” over the years I have been writing here, I have made frequent reference to my thoughts on the use of “digital darkroom techniques” to “enhance” my own images. I think I have made position clear when it comes to the art of photography. But Mr. van Agtmael ventures into photography that is not made, per se, as “art.” Rather, he addresses what I refer to as “reportage” photography. Presumably, the image depicts things exactly as they appeared. Humanity is not scientific. Biology is. The human brain is a scientific wonder. The workings of human brain? Well that is only “scientific” to the extent that it is thinking about science. The rest? It’s an art form for certain. How else can both the consistency and inconsistency of human thought be explained? And so, Mr. van Agtmael posits something we have all heard back in our own ancient histories, at some point. In my words, “truth isn’t absolute.” But that is a bit cliche‘. In his much more eloquently stated words: ” ... there were a lot of loaded words like ‘truth’ and ‘objectivity’ being thrown around. I don’t really believe in these words. I’ve never met two people with the same truth, nor seen true objectivity ever demonstrably applied to anything. They are nice words, but remain aspirational and cloud a more nuanced interpretation of reality and history. We shouldn’t mistake something factual for something truthful, and we should always question which facts are employed, and how.” I like that. Our world is filled with millions and millions of “facts.” We also hear a lot of opinion which is cited as fact. But even with incontrovertible, empirically provable facts, it is still important to understand context and relevance. The opening image here is (OMG!) altered. I know viewers will say I “saturated” it, I “enhanced” it, etc. (maybe; maybe not 🙂 ). But that isn’t really what I mean. This image was physically “altered” before it was even made! I had an image I wanted to depict, and in the crotch formed by the 3 trunks there was I small pile of dead branches which were (in my view) unsightly and distracting. Is it relevant that I removed them and spread the leaves around a bit? Could the image have been found the way I have presented it? Perhaps if I were trying to depict the “pristine” quality of nature, or deny that it can sometimes be messy, the answer would be different. I appreciate that this is not reporting on the refugee crisis and is trivial in relation to that. But this is a photography blog, and I don’t do reportage photography. I just thought Mr. van Agtmael’s point would resonate even in the perhaps less significant milieu of nature photography. How else can both the consistency and inconsistency of human thought be explained? Those who have read here previously know the story of the Goat Island Light Image. I placed those chairs there. “Hand of man and all that good stuff.” Again, I don’t mean to trivialize the serious piece. But I do think the larger point has application to all of our photography. If the viewer looks carefully at the bottom center of this image, there is a snarl of yellow polyethlyene rope in the foreground. A better photographer than I would probably have seen that detail and excluded it (or perhaps purposely included it, again depending on the goal of the image). I would not perhaps shock anyone here that before I made a print of this image I (GASP!) “Photoshopped” the rope out. But seriously, I would commend the reader to read the Peter van Agtmael piece on Steve McCurry debacle. While you may or may not agree with me, or with its premise, I hope you will agree that it it thought – provoking.